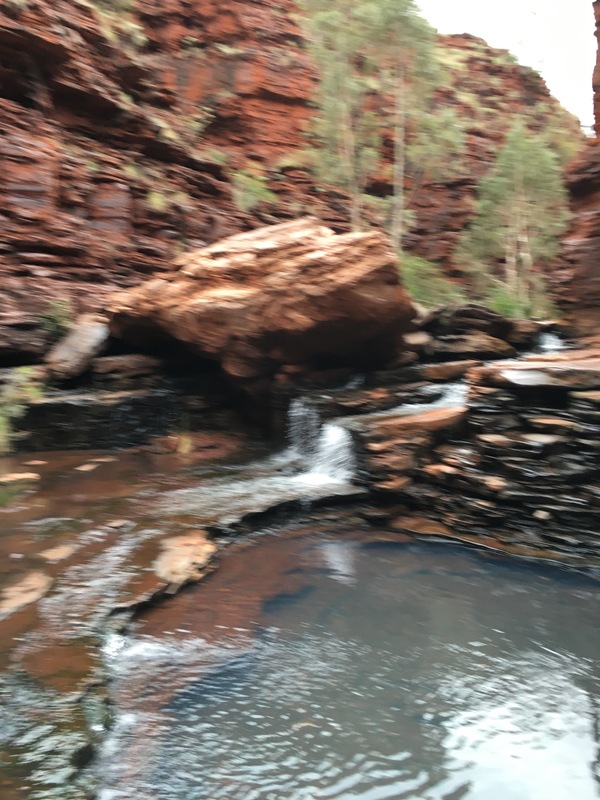 We drove the four hours from South Hedland to Karijini only stopping for fuel and got to the information centre in the early afternoon and paid for two nights at Dale’s campground. When we drove up the road to enter the campground section there was a sign in the middle of the entrance saying ‘camping full’ and we noticed other cars turning around. I thought ‘bugger that I just paid for two nights’ and kept driving to the volunteer office. I was greeted by a very flustered woman trying to sort campsites and her much calmer husband who reassured her that our camper was only small and could easily fit into what I could tell from her colour-coded map as the last available campsite. She got more flustered when I told her that I might want to add a third day at some stage! 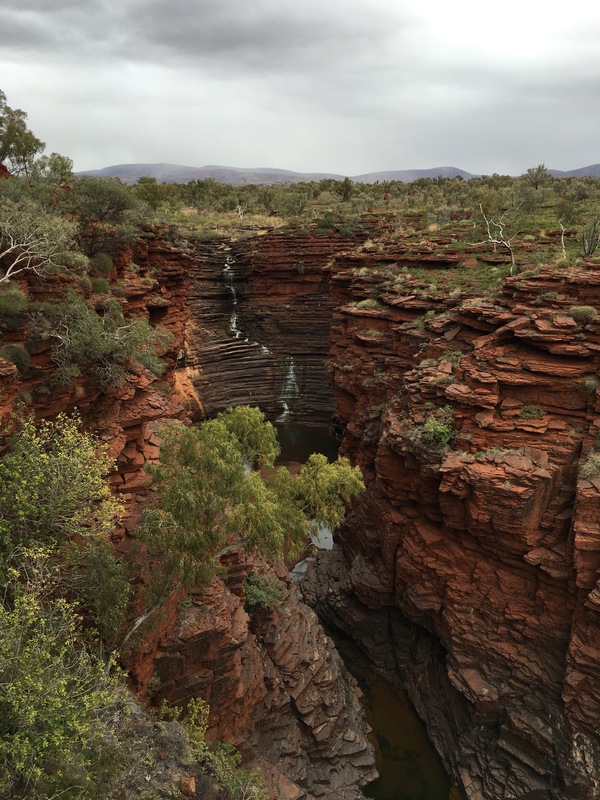 We set up most of the van and headed to Fortesque Falls for a quick look and to do the one hour return walk (the walk in only took us ten minutes though it was all downhill). 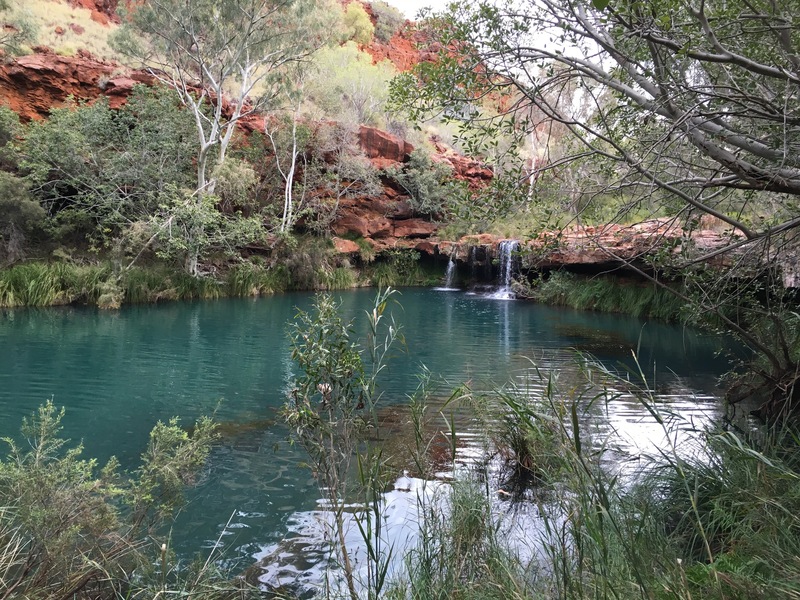 While we were checking out Fern Pool we bumped into our Kings Canyon family again and got chatting to them. They’d walked all the way to the falls and I’d driven so on the way back Master14 joined them for the walk and I took Miss6 and their Miss7 with me in the car. They were camped not too far away from us so we sat with them at their camp enjoying a lovely glass of wine while the kids all played. 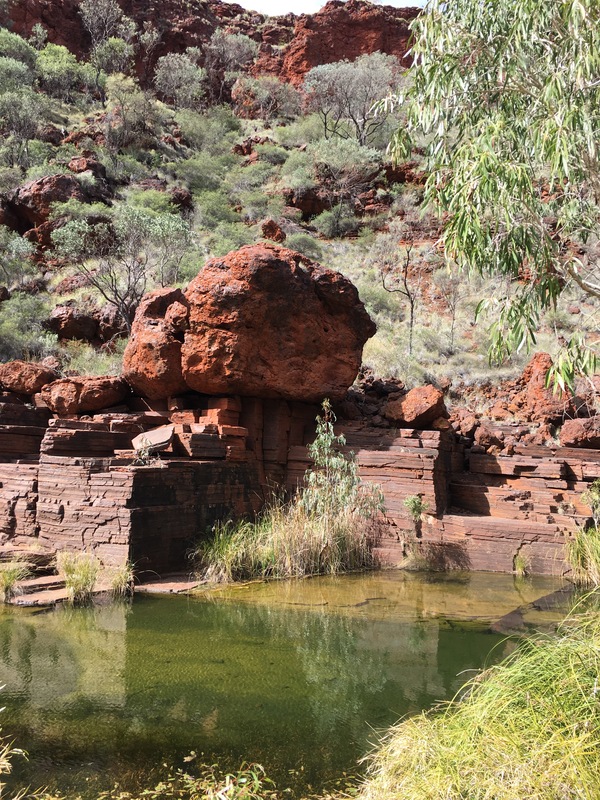 The next day we thought we’d drive to some of the other gorges out near Joffre Falls – there were a few class 5 hikes out there that we thought we could have a look at with our Kings Canyon (KC) family possibly joining us. 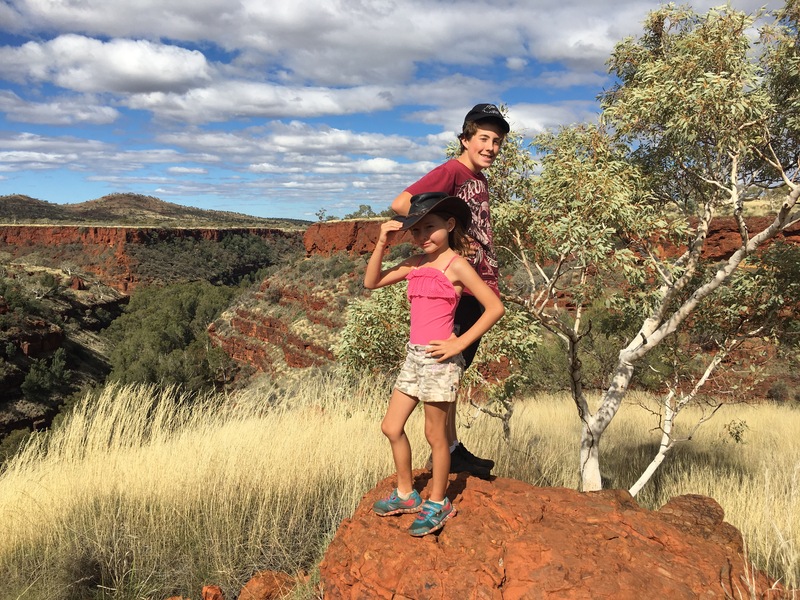 In the end, the two eldest KC family kids came with me and though Miss6 had the option of staying back to play with KC Miss7, she opted to have a crack at the class 5 hike. The walk into Joffre Falls wasn’t too difficult until right at the end where we had to manouvre down some vertical parts with backpacks and around the water. The older kids had a swim in the falls when we got down there but it was too cold for Miss6 and I so we just walked along the ledge getting wet only up to our knees to sit on the waterfall for the token ‘we made it’ photo. We’d planned to meet the rest of the KC family at the main carpark at Weano Gorge for lunch so after taking 17 minutes to get back out of Joffre Falls (it was supposed to be a two hour return hike), we took a quick look at the lookout before jumping in the car to head to Weano. We all ate some lunch from the backs of the cars before heading to some of the other lookouts nearby. 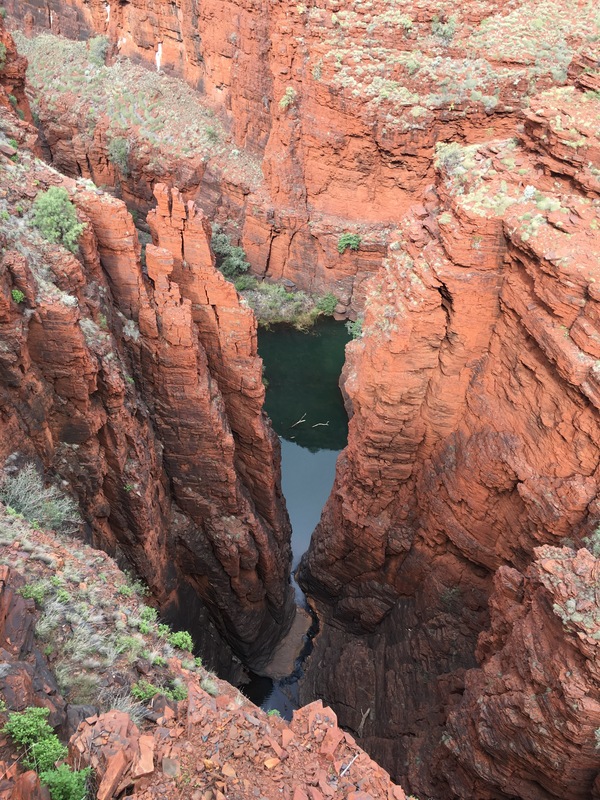 The gorges here are unlike any other we have seen on this trip. All of the other gorges we’ve visited we’ve driven or walked in at ground level and then walked up to see the view from the top. 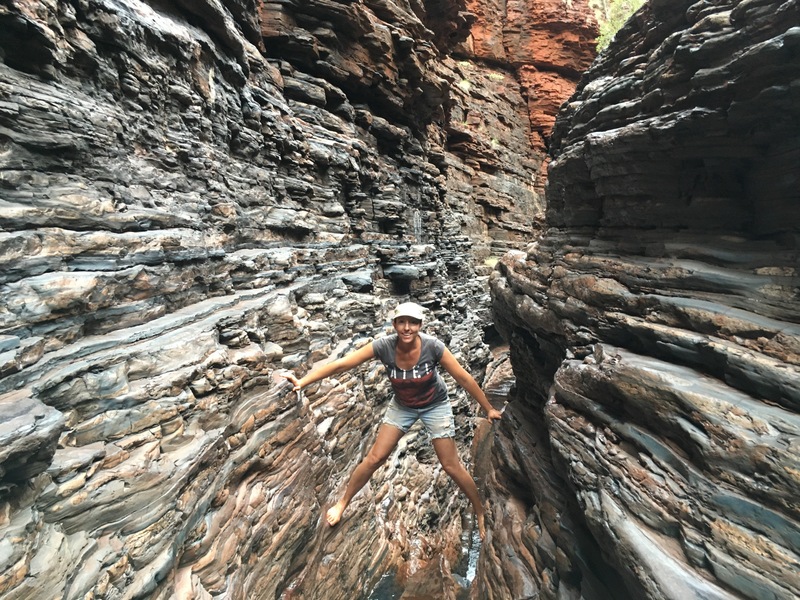 At Karijini, you drive or walk in at ground level and although there are mountain ranges all around you, you enter the gorges from the top and walk down into them. From one of the lookouts, there was a section of gorge wall that appeared to meet the water at one point but it was actually an optical illusion with the shadow on the water making it appear half as tall as it actually was – that was the other thing about these gorges – they seemed so much deeper than the others we’d been to. The optical illusion actually made me feel a little dizzy and I had to blink a lot to feel like I was seeing straight again. Back into the cars to park further up near the toilets and main walking track down into Handrail Pool, another Class 5 hike for us to take on. 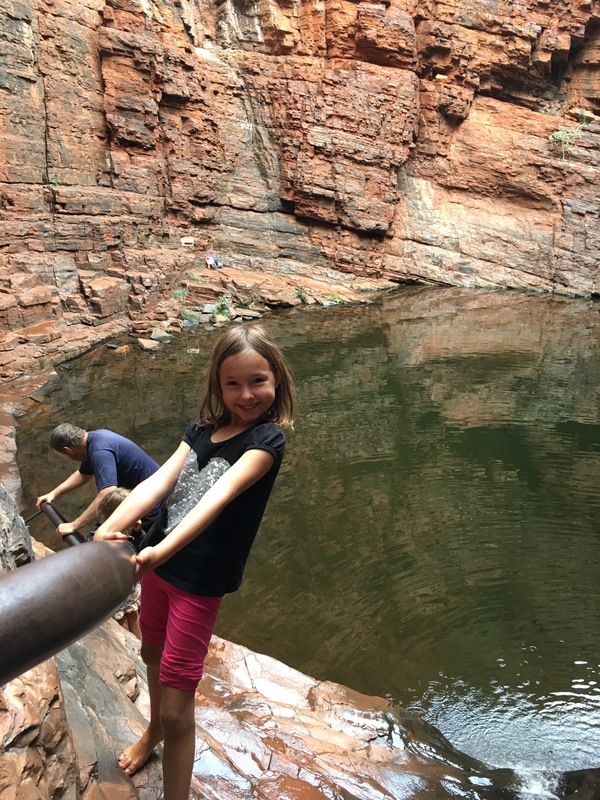 This time, all of us took the hike and I was very impressed with the younger girls making their way down the narrow waterfall holding onto the handrail and down into the gorge pool with what seemed like very little effort. The water here was freezing and my ankles actually felt like they were in pain in the water so I only went in knee deep again while Master14 had a brief dip and our braver KC family friends had a swim in the icy waters (I now know why the brochure recommends wearing a wetsuit down here). There was one more Class 5 hike that we’d seen on the map and I’d heard good reviews about – it was down to Kermits Pool through the Spider Walk and all of the kids wanted to do it except KC Miss7 so I took us all down there while KC parents went to the nearby cafe to get ice and wait for us to return. 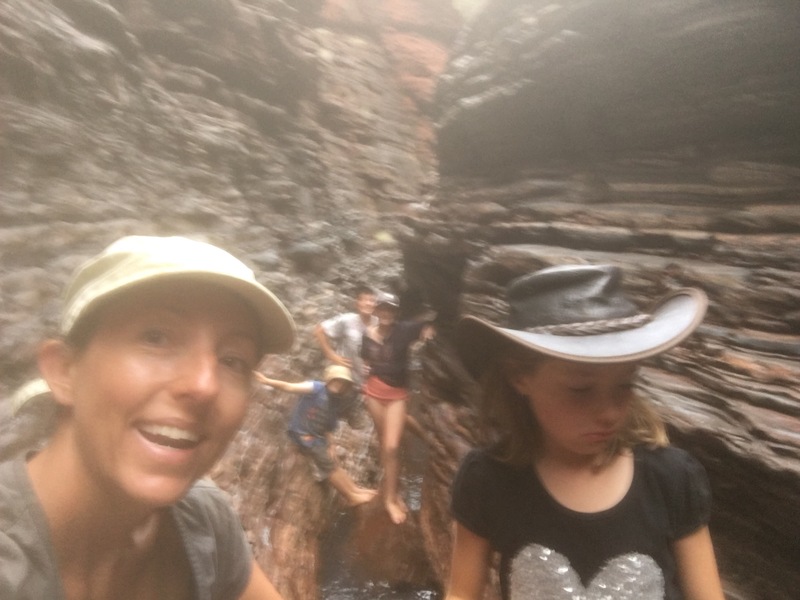 This last hike was probably the most difficult as we needed to wade through thigh-high cold water just to make the walk so I piggy-backed Miss6 (the water would’ve come to her chin) with our shoes tied to my waist. Master14 and the eldest KC girl flew ahead of us while Miss6, KC Master10 and I took it a bit slower walking to the Amphitheatre. This section required shuffling along the narrowest of ledges with icy water below us and a sheer rockface above us. Miss6 with her little feet managed this section like a superstar monkey while I lagged behind trying not to fall off. 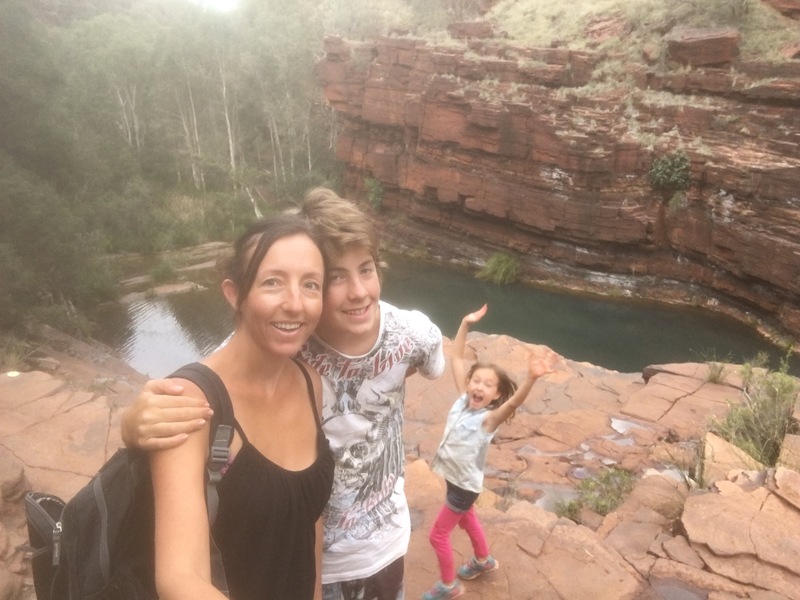 We made it to the Spider Walk with the timer on my phone going off (I’d set it so that I knew we’d get back out and back to the car before sunset) but Master14 and KC Miss11 were so far ahead that they’d made it all the way to Kermits Pool for a quick dip (but no camera!). Miss6 was a bit short in the arms and legs to make it all the way through the Spider Walk so she went in far enough to get the iconic photo before we all started making our way back. 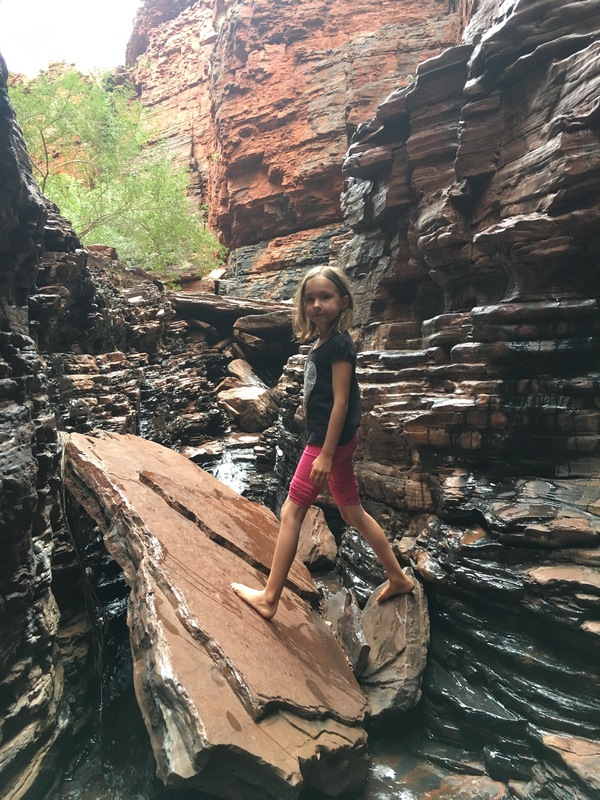 On the way back, Miss6 decided she could scale the walls rather than have me piggyback her but as she climbed off my back, she knocked her shoes into the cold water and ended up having to walk all the way back to the car in bare feet. It was dark by the time we all met up at the cafe where I thought KC Mum and I deserved a nice hot cuppa and shouted us one from the cafe. In the carpark there was a 4WD there with smashed windscreen and I spoke to the backpacker driver about what happened, she and her friend had lost control of the vehicle on the dirt roads and rolled it several times writing it off. The ranger had taken the rooftop tent off the top for them and set it up in their campground on the ground – they were very lucky! 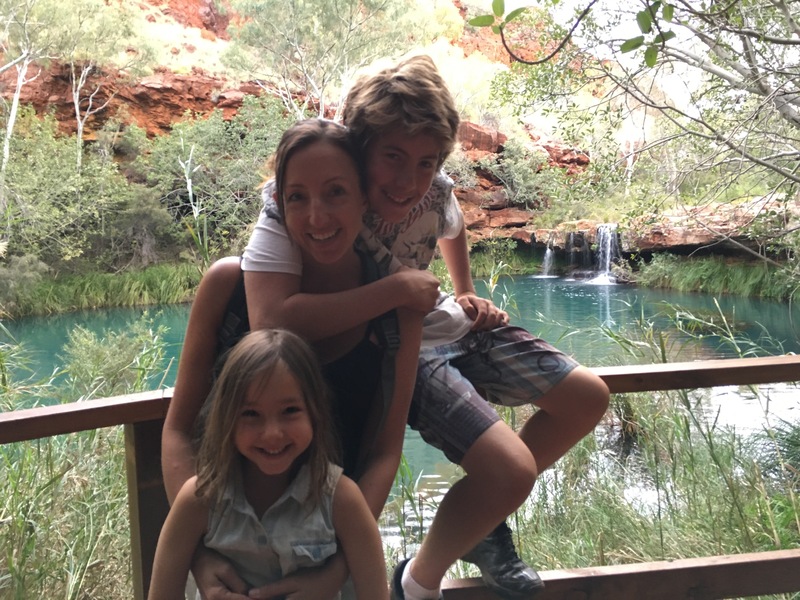 I’ve heard so many stories of backpackers not being used to the Aussie outback driving conditions and getting into trouble – it’s sometimes scary being on the road with them! After smashing out three Class 5 walks in one day I was pretty impressed with our little kickarse family (a name that Miss6 has cottoned onto and loves to talk about!). We went to bed with a full moon sitting majestically surrounded by cloud – a very picturesque image to fall asleep to. After our big day I thought we’d sleep in the next day but these plans were very rudely shattered at 6.50am when the sounds of a car horn alarm starting going off repeatedly – they sounded like they were camped next door but I think everyone who heard it felt like that. We stopped in for a nice hot cuppa with our KC family (who’d also been woken by the car alarm) before taking the car to the Circular Pool carpark to make the hike down into the pool. It was a beautiful sunny day so I thought the water might be more conducive to us kickarse family’s cold bloodedness around the water. 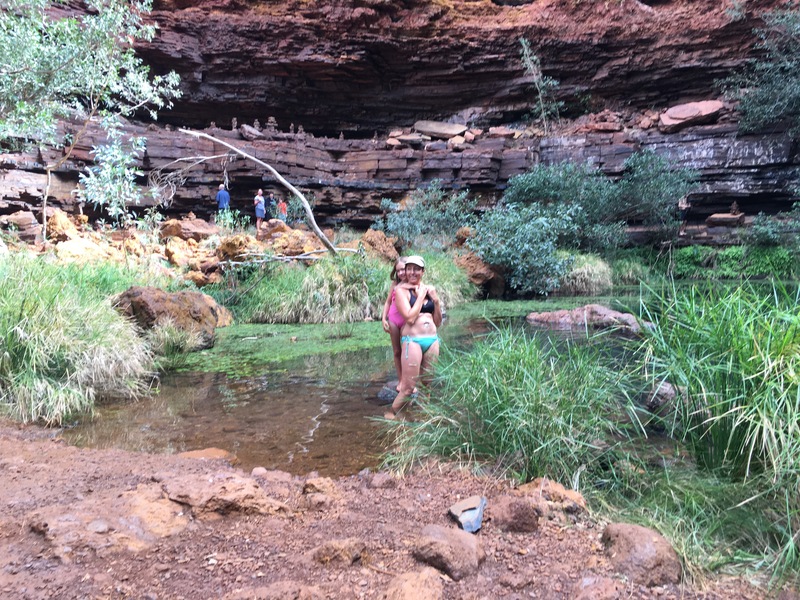 Miss6 and I went in the water as far as our mid-calves when I remembered that KC Mum swam here the other day and got cramps from the cold – and she was much more adept to swimming in cold water holes than I was! The pool itself was very picturesque with bright green moss growing over the surrounding rocks and crystal clear waters falling from them into the small and pretty pool below. 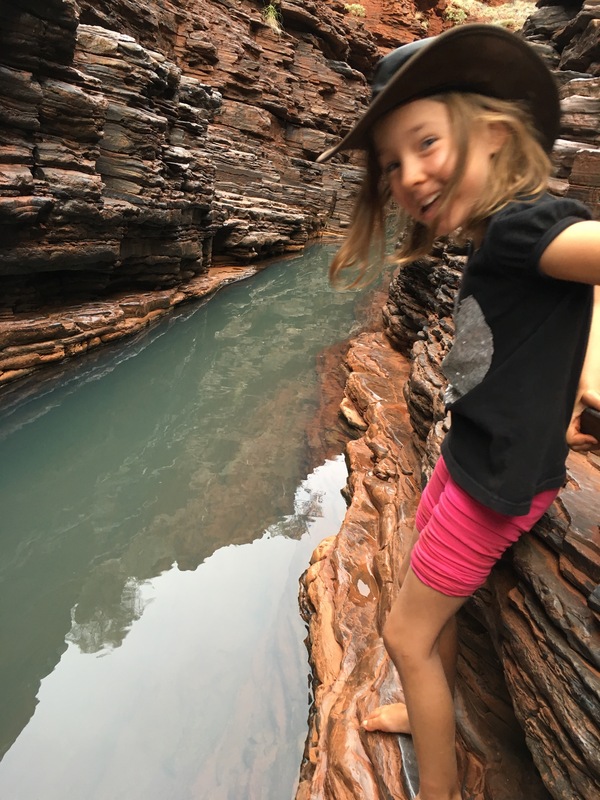 After admiring the pool we headed back up along the bottom of the gorge until Miss6 jarred her ankle jumping from rocks and couldn’t walk on it. It was the first time I’d needed our little First Aid kit to strap her ankle which made her happy and we continued walking the rest of the way having a competition to see who could count the most track markers along the way. We got all the way back up to Fortesque Falls and the sun was shining brightly over the water making it much more temperate and inviting to me. 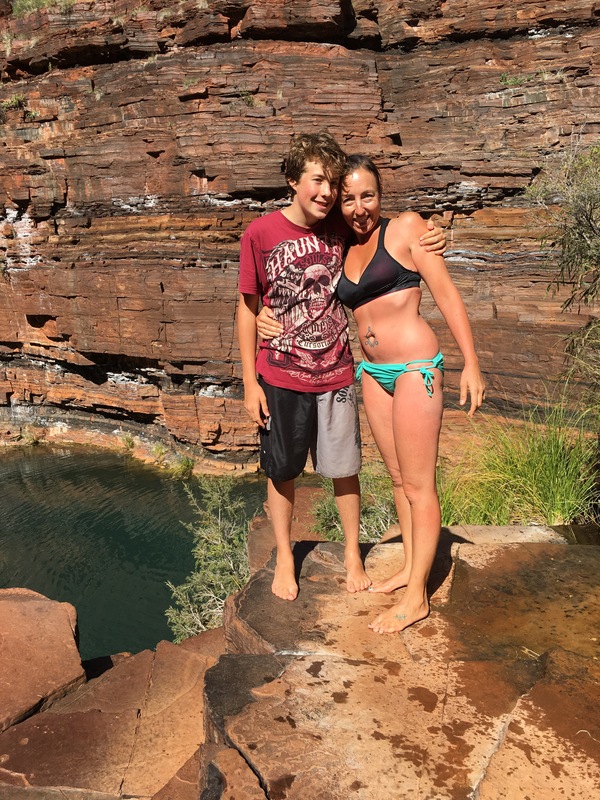 We jumped in the water after taking Miss6′ bandage off and had a swim over to the falls and the rock ledge on the other side. Though the sun was out and the water just above freezing, it was still pretty cool for us so we didn’t swim too long before we hopped back out and made a start on the hike back to the car. We took the scenic gorge rim walk on the way back, looking down into the gorge we’d walked along earlier that day. 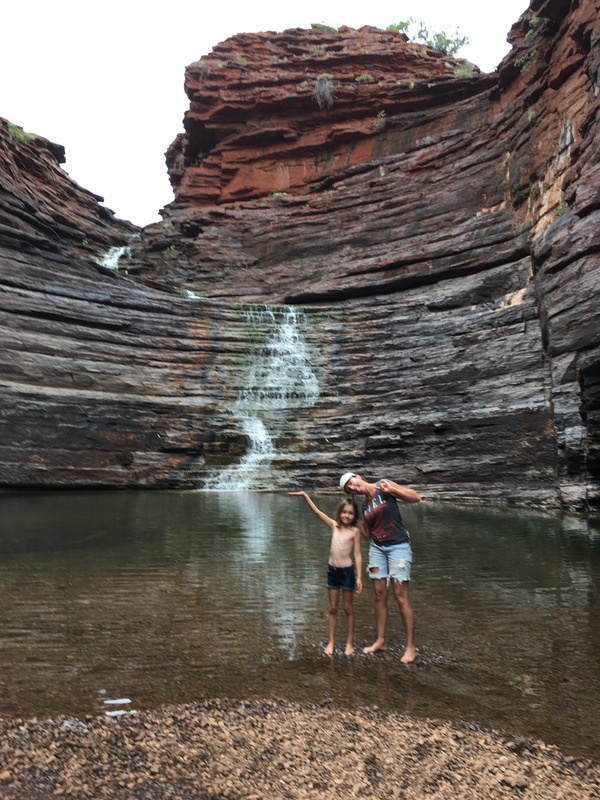 We learned through our hiking that the gorges at Karijini are around 2.5 billion years old making them the oldest gorges we’d been to (many others we’d been to had been as old as 1.8 billion years) and the tops of which we were walking on back to the car were once the seabed. After our big day of hiking we stopped past our KC family’s campground to say hello and drop off a refilled water bottle we had for them. 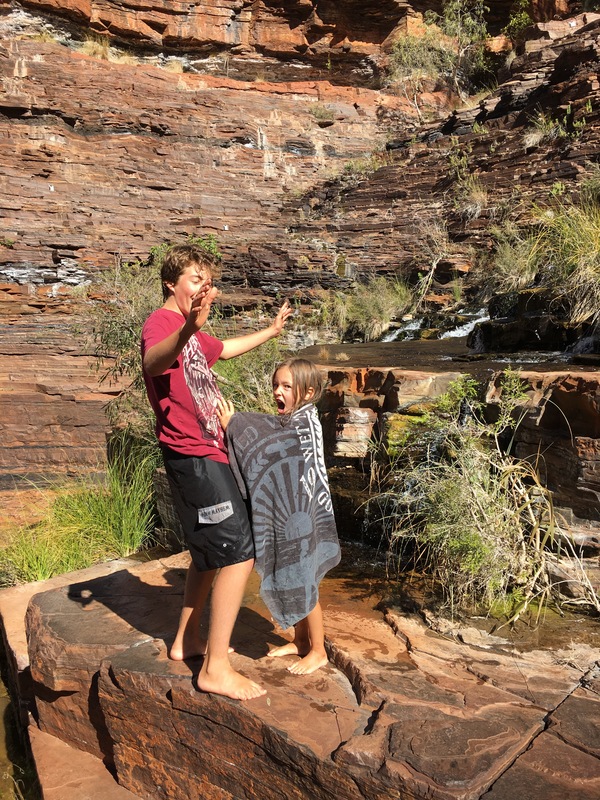 They invited us over for a roast dinner so after we got back to the van for a late lunch, the kids walked back to the KC camp to play while I got to have two hours to myself – the first time since my horse ride at El Questro! I did spent most of it tidying up and getting some veggies ready for dinner but also managed a cup of tea in there too. 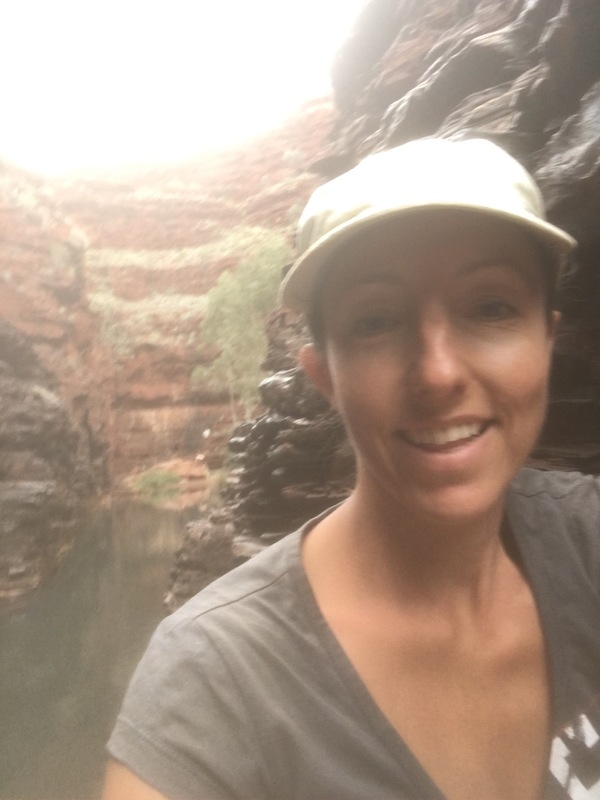 Over dinner we chatted about all of our adventures so far and shared our funny stories of camping with kids in remote Australia – it was lovely to be able to get more than just the ‘where have you been what have you seen’ chat done and really get to know people more. We realised that the KC family were our kind of people (they even barracked for Collingwood so that got them a big tick) whose kids played like mine and we all found the same humour in some of the crazy things our kids did. We were all heading in the same direction the next day though I was hoping to get a lot further along – I might reassess this plan after talking to our KC family, if they don’t think they can make it that far in one day I’m not sure how I think I can as I drive a lot slower and only have one driver… Like everything else on this trip – I’ll play it by ear.